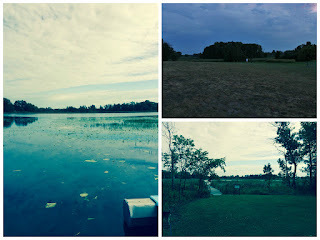 Our second stop in Minnesota took us to Detroit Lakes on July 12th. The name actually made Nancy a little homesick for Detroit. This was a short trip, just under 2 hours. We did run into some terrible storms. It rained so hard we thought about pulling over but Les mustered on. We were about 45 minutes from the campground when our phones starting beeping like crazy. There was a tornado warning in every town we went though. Nancy kept her eye on the sky as Les drove and also kept a look out for a safe place to run to if needed. 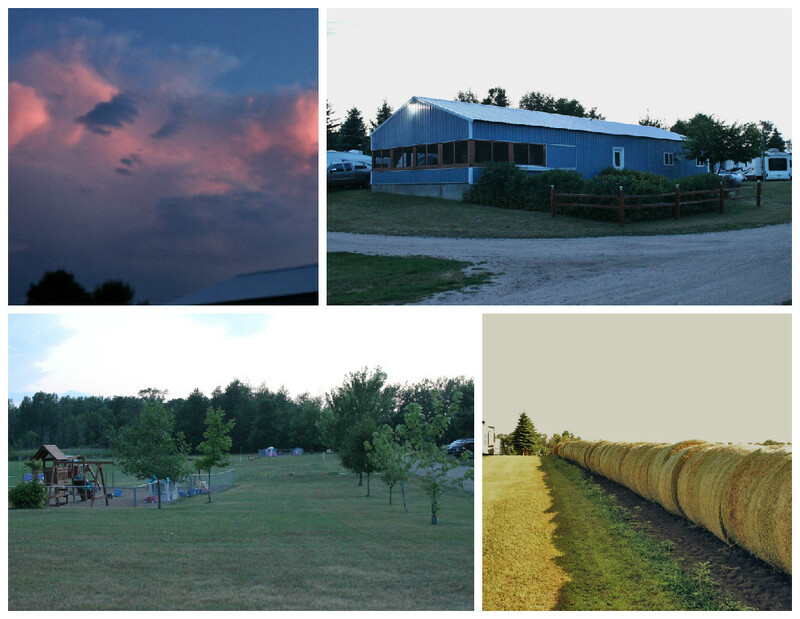 Luckily no tornado's were spotted, and the skies started to clear when we arrived at the campsite. We did hear later that some were spotted south of us. We stayed at Country Campgrounds, a private campground, owned by Elwood and Karen. It is just a few miles south of Detroit Lakes. There are 35 sites. The sites were good sized and well shaded. Elwood led us to our site and helped guide Les in. The service and attention was great. They have a rec-room with a pool table, table tennis, and air hockey. There is a 1/2 mile walking path around the campground that was perfect for walking the dog. They have two playgrounds, one for older kids and one for toddlers, a 6 hole golf course, horseshoes and volleyball. There is a large empty field to play in. 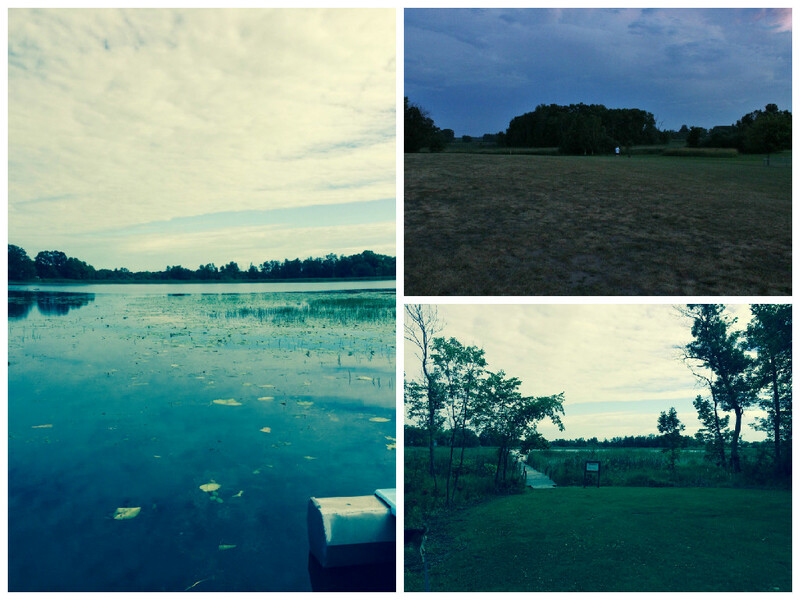 The campground is surround by farm land on three sides and a small lake on one side, they have three paddle boats that you can use. All of this is at no extra charge. The bathrooms were very clean, although they were kept lock and each camper was given a key - a little strange but... the laundry room was also super clean which made Nancy very happy. 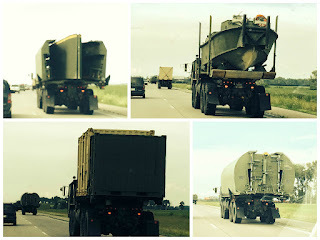 Our first venture took us to North Dakota, it's no wonder we never know where we are! Along the way we found a few Roadside Oddities, Large Cement Dog in Glydon, MN, in front of a now defunct boarding place and a train in Dilworth MN. We stopped in Moorehead, MN to see a viking ship, little did we know this quick stop would turn into an hour. 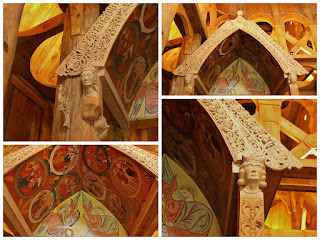 The ship is inside the Hjemkomst (Yem-komst) Center (Welcome Center), which is also home to a Stave Church and a museum. It was a really interesting place. It is right on the river and the grounds were beautiful. 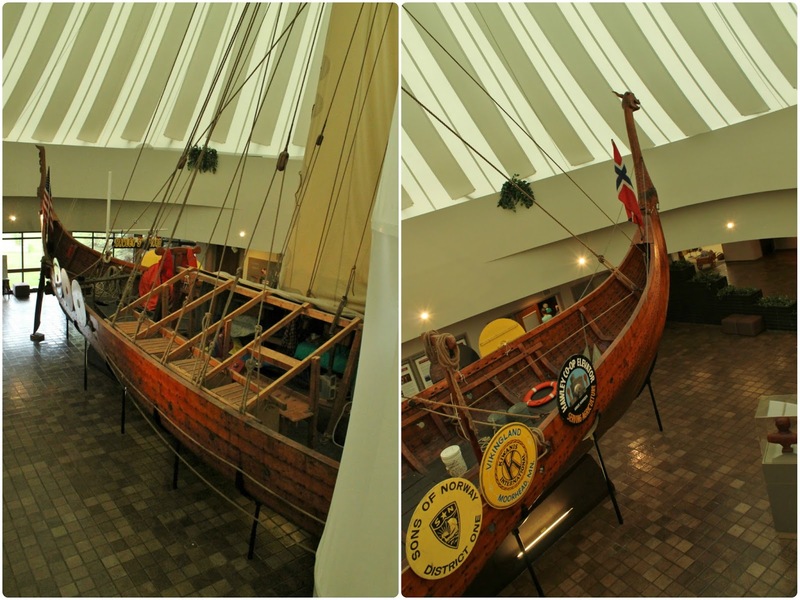 This Viking ship was the dream of Bob Asp, a guidance counselor at Moorhead Junior High School. Bob and his brother Bjarne had talked of building and sailing a ship like this to Norway for years. During the summer of 1971 Bjarne was studying Norgian history. That same summer Bob suffered severe injuries from a fall and was laid up for months. Bjarne supplied him with many books about the Vikings and their ships. Bob based the design of his ship on the Gokstad burial ship. It had been unearthed from a burial mound near Sandefjord, Norway in 1880. After one year of planning, construction started. First, they needed trees, and lots of them, Bob originally estamated it would take 15 oak trees, but the ship required well over 100 trees. Most came from a local farm. The construction took place in an old warehouse in Hawley, MN. The city counsel purchased the empty building and leased it to Bob for $10 a year. It was quickly dubbed the Hawley Shipyard. The ship took 6 years to complete and many many people assisted in the building. Bob was diagnosed with leukemia in 1974 but continued on with his dream. On July 10, 1980 the front wall of the building was torn down, with the ceiling and side walls being supported. Seven days later on July 17th, the ship made her entrance. It took a tow truck and winch to inch the ship out of the building. A crane picked up the ship and placed it on a flat bed. On August 5th, at 9 pm. the overweight and over-sized ship started it's journey to Duluth, it could only be driven at night and by special permit. Bob's nephews who owned Asp Brothers Trucking drove the truck and it was escorted by state troopers. Bob sailed the ship in the Duluth Harbor on August 9th, and took his last voyage in her on September 27th. Bob passed away on December 27, 1980, but his family was committed to keeping his dream alive. In May of 1982 after two years of training and tweaking the ship a crew of 12, which included his sons and daughter, sailed through the Great Lakes to New York to cross the Atlantic Ocean. On July 19, 1982 after enduring many storms and broken ship parts they arrived in Bergen, Norway to a hero's welcome. The museum exhibits were very interactive. 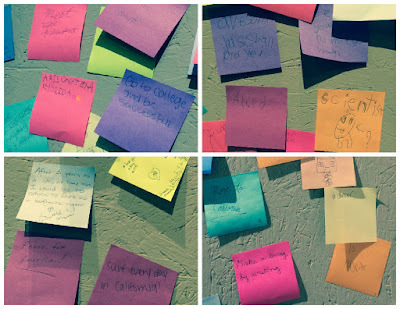 One told the story of the dreams the immigrants had when they arrived here in America. They had post-it-notes for people to write their dreams on. Was neat reading all of them. 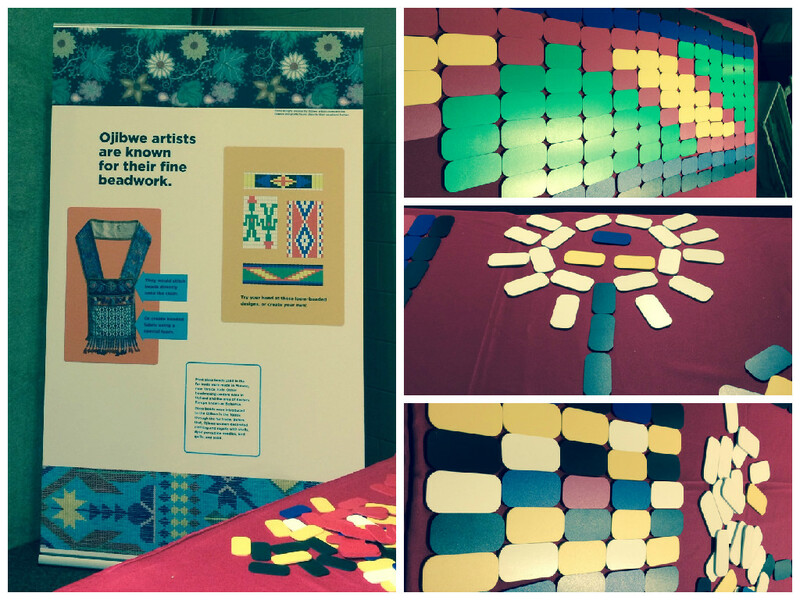 Another fun one was the Ojibwe exhibit. There was a large table with foam pieces laid out so you could create your own designs. You know Nancy spent some time here playing with them. 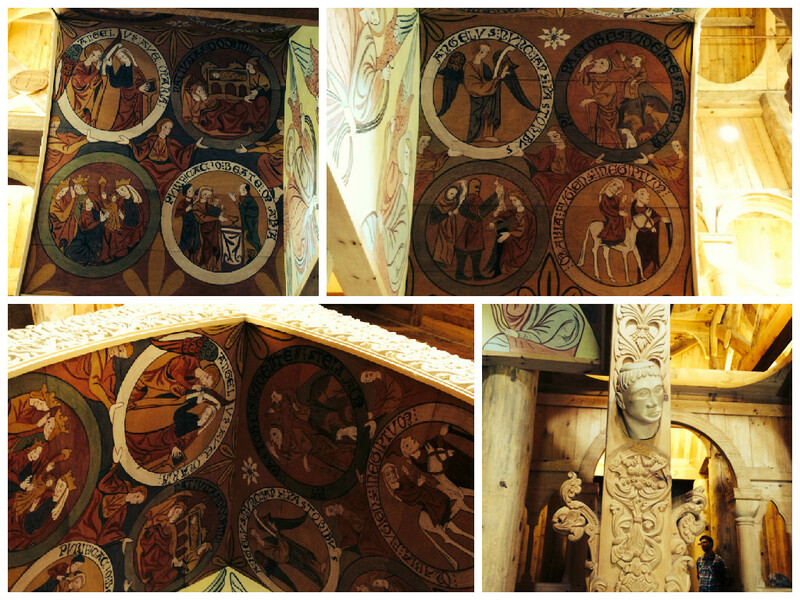 The Stave Church was stunning. 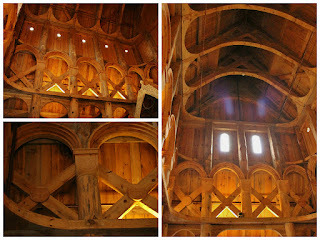 Norwegian Stave churches started being built just after the end of the Viking Age in Scandinavia in 1000 and 1200's. The technique of using vertical posts-or staves-had been modified over time to become works of art. 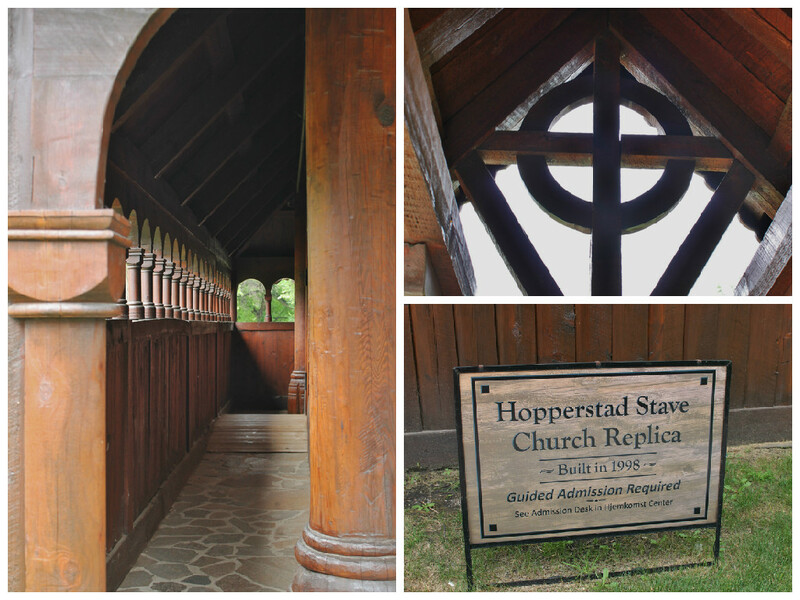 This church is a full-scale replica of the Hopperstad Church in Vik, Norway. 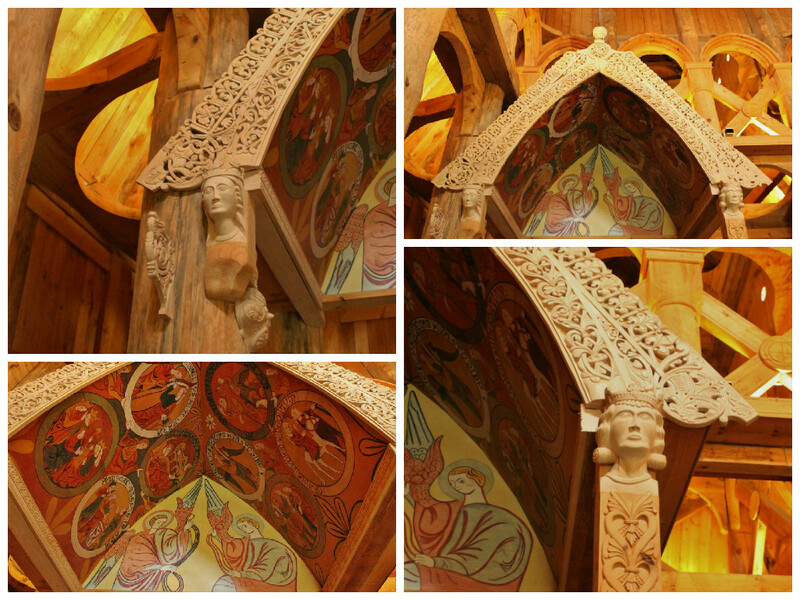 It was a labor of love, carved by Guy Paulson. 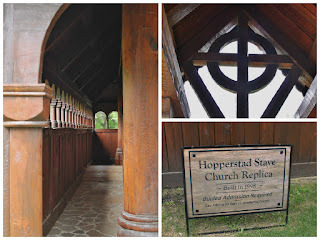 He started the carvings for the church in January of 1997. The construction of the church started in August 1997 and dedicated in 1998 as a gift to the Center and the city of Moorehead from the Paulson family. Guy said "It's something that honors my family's Christian heritage." 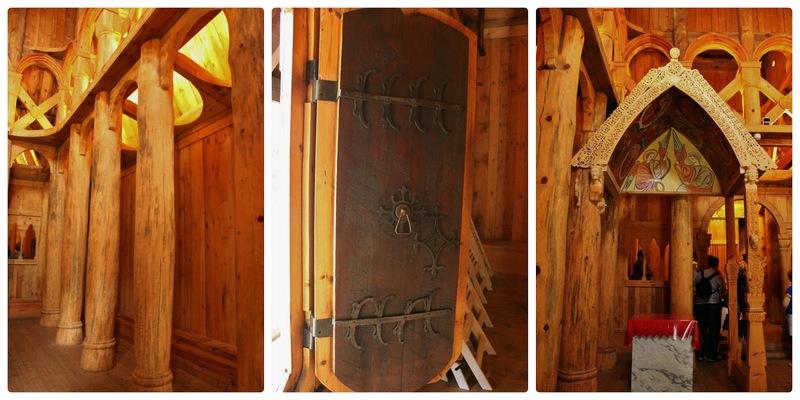 There is a enclosed walkway around the entire building that served as protection from the weather and also those who were not baptized or were ill could not enter the church, but could listen from outside and see through small windows that had little doors on them. There is a small free standing altar in the center of the room, no one but the minister was allowed on the actual altar, so the commoners could receive blessings at this small altar. 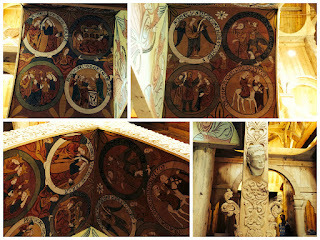 The ceiling, posts and roof are elaborately decorated and carved. Benches that lined the walls were for elderly or impaired people to sit on, all others stood for the service. 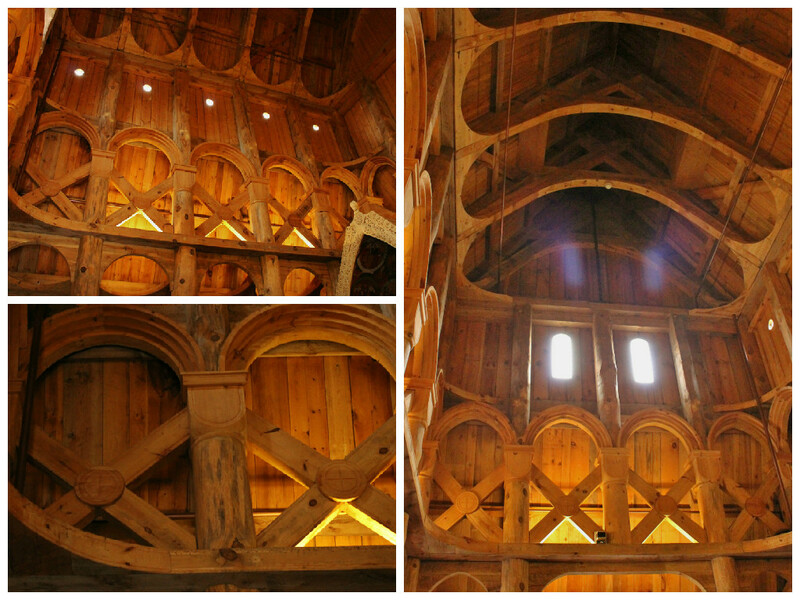 The detail of all of the pillars and cross beams inside was amazing. After Moorehead we crossed the Red River into Fargo, ND. We explored downtown and went to the Fargo/Moorehead Visitor's Center, where they have the Fargo Walk of Fame. 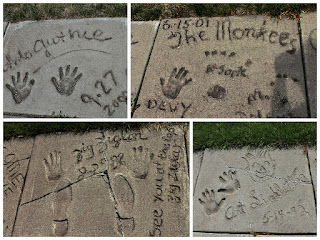 It was started by local businessman, Mike Stevens after he visited Mann's Chinese Theater. He began approaching celebrities who were visiting Fargo with a slab of wet cement, asking for their hand and footprints, which he would then set into a 40-foot stretch of sidewalk in front of his downtown print shop. When the movie "Fargo" turned the city into something of a celebrity itself, the Walk of Fame was moved to the welcome center. There is also a wood chipper like the one used in the movie "Fargo" and a very colorful Buffalo. We headed north to Grand Forks, encountering more storms along the way. We drove right on the edge of the storm front. The skies cleared as pulled in Grand Forks. We took another stroll down memory lane when we drove past the Air Force Base that Les was stationed at. We found a few Roadside Oddities along the way. The Keg Deli in Grand Forks. A Large Ox, Cart and Farmer in Crookston, MN and a Polar Bear and Seal in Winger, MN, and a beautiful rainbow after another storm. Detroit Lakes was a nice town, lots of things to do. They have a beautiful beach at the south end of town, lots of restaurants and some cute stores. Would come back this way if we are in the area again. ~ When making your reservations at a campground ask if their address works with GPS. Otherwise you can find yourself in the wrong place in a big rig that is hard to turn around.